U.S. Space LLC, a U.S.-based creator of dedicated space solutions for government and commercial clients, and ATK, an aerospace, defense, and commercial products company, today announced the creation of ViviSat, a new satellite life extension venture. ViviSat provides geosynchronous satellite operators with flexible, scalable, capital-efficient, and low-risk in-orbit mission extension and protection services that can add several years to the revenue-producing life of a satellite. 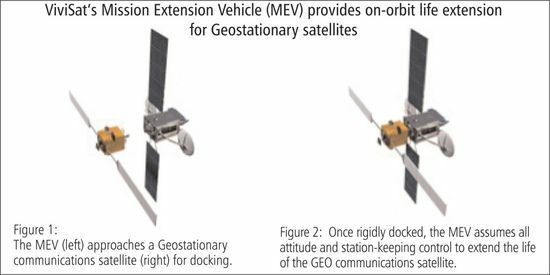 ViviSatâ€™s Mission Extension Vehicle (MEV) is designed to dock with the orbiting satellite, securely latch on to it, and serve as a back-up propulsion system.Â This enables a mission extension for satellites which have run out of maneuvering fuel yet still have plenty of electrical power to operate their payloads.Â ViviSat services include rendezvous and docking without interruption of satellite operation, long-term station-keeping and attitude control, relocation to different orbits or orbital slots, de-orbiting, and rescue and re-orbiting of satellites stranded in incorrect orbital slots. Major General, USAF (Ret.) Craig P. Weston is Chief Executive Officer of ViviSat. Bryan McGuirk is Chief Operating Officer of ViviSat. Mark Piegza is Chief Financial Officer of ViviSat. U.S. Space LLC is a U.S.-owned provider of dedicated, commercial space solutions. The company was established in January 2009 as a U.S.-owned provider of satellite solutions with a unique model combining the best commercial and government practices. The company, which is run by a small group of highly respected former military and corporate leaders, now offers a variety of dedicated space solutions to serve the nationâ€™s interests. More information on the company is available at www.usspacellc.com. ATK is an aerospace, defense, and commercial products company with operations in 24 states, Puerto Rico, and internationally, with revenues of approximately $4.8 billion. News and information can be found on the Internet at www.atk.com.